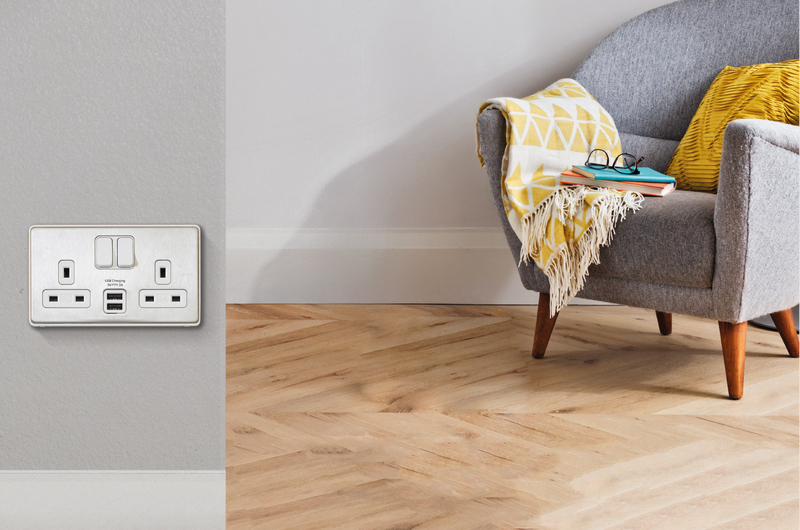 MK Electric has launched a new range of screwless wiring devices, Dimensions, a two-piece, installer led solution which has been, designed to provide hassle free specification and installation without compromising on style, quality and value. With a simple, modern design, Dimensions is suitable for a whole range of contemporary spaces, from residential developments to hotels and commercial buildings. The range is available in eight high quality finishes – metals and synthetics – allowing for scalability within any design, from a typical hotel room to a larger suite, or ‘back of house’ offices to high footfall reception areas. Designed as a two-piece product solution, it is available as two individual parts, a functional module and clip-on front plate, which can be ordered and installed separately to fit in with a project schedule, as well as reducing the risk of front plate loss prior to fitting. The functional module, available in black or white, comes with a robust and recyclable protective clear cover plate to safeguard the final front plate against on-site damage like paint splatter or build up, abrasions from plaster sanding or knocks and scrapes from tools or ladders. The protective cover ensures the device meets British Standards and therefore the functional module is fully operational, allowing work to continue as usual. When ready, the cover is simply clipped onto the final front plate to create a neat finish. The two-part installation also offers a high level of flexibility to the customer, allowing them to upgrade and interchange front plates as the design and the décor inside the building changes over time. The final front plates are tool removable, using just a screwdriver, and as they are not connected to the mains power, they can be fitted by a less experienced worker. With a broad range, Dimensions features the latest product innovations, including integrated USB socket outlets, LED dimmers and multimedia plates. The range also includes a whole host of other features to ensure ease of installation, including the front plate multi-lock system, which helps secure front plates on less-even walls, backed out and captive terminal screws and inline terminals. Also included are safety features such as MK’s three-pin ‘child resistant shutter system’ and dual earth terminals, a good solution for high integrity earthing applications. MK says Dimensions provides peace of mind for contractor, customer and end user, and comes complete with a 20-year guarantee.